Toronto employers were on a hiring streak this October, with a 27.3 percent increase from October 2016 to October 2017, according to the November LinkedIn Workforce Report. Seasonally-adjusted hiring is also up 7.7 percent from last quarter. It’s not tech-skilled workers Toronto needs most but healthcare professionals: The Greater Toronto Area (GTA) skills gap is mostly driven by a scarcity of workers with service-industry skills like healthcare management; nonprofit and fundraising; education and teaching; nursing; construction; marketing event management; and criminal law skills. The need for workers with health care management and nursing skills points to continued momentum in Toronto’s health care industry and can also be partially attributed to Canada’s aging population and growing need for healthcare services. The GTA continues to lose workers to the U.S.: The San Francisco Bay Area, New York City, and Los Angeles – replacing British Columbia in this quarter’s Workforce Report — are the top three cities Toronto has lost the most workers to in the last 12 months. Toronto is gaining talent from the Middle East and rest of Canada: Toronto attracts the most workers in the last 12 months from Montreal, Mumbai, and the United Arab Emirates. The LinkedIn Workforce Report helps workers better navigate their careers by highlighting workforce trends in the GTA. Insights include whether hiring is up, down, or flat, which skills cities need most, and where workers are moving to and from. LinkedIn will be rolling out the Workforce Report to additional cities across Canada over the next year. 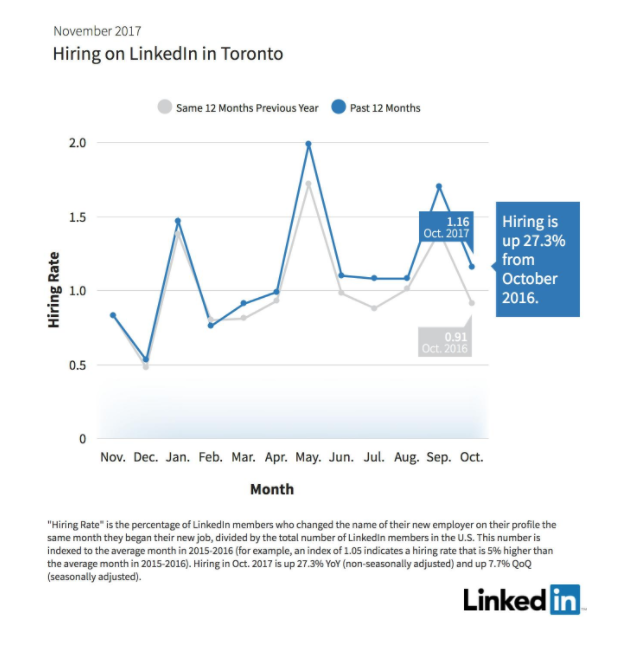 Click here to read more of our Toronto November LinkedIn Workforce Report.